When I got a Mac one and a half year ago, I never thought I’d become an Apple fan-boy. I still have my gaming PC that I keep upgrading and it’s caused my a lot of griefs lately. The power supply on my uber-fancy gaming case broke down. The machine had to be restarted 10-15 times until XP booted. All this restarting while booting screwed up the harddrive. So, now I’ve spent a bunch of $$$ on a new case, PSU and harddrive but I still can’t get it up and running - because of sloppy programming. You need a mouse to install the mouse! No, I’m not kidding. 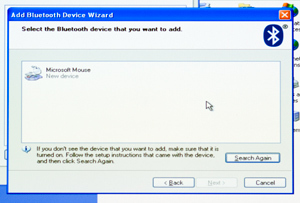 You have to click the device found, but it is not possible to navigate to it using the keyboard. I order to install Microsoft Intellimouse Explorer for Bluetooth, you need to have a wired mouse! I don’t have one since my kids played with the old wired one I had and now it’s broken. Not only are the batteries this mouse requires expensive, now I’ll have to buy a mouse to use my mouse? Seriously - the reason why I think Microsoft is going down the drain faster than you can say “OSX” is that their coders simply does not care about the end user. They just don’t care if they make crappy software. Apple is improving somewhat in this area though, but it’s far away from a gaming platform. Too bad Microsoft snapped Bungie/Halo back on 2000…. One discourse on why use PCs over Macs is because there are more games for PCs. But honestly, what is the percentage of people playing games on computer? I bet it’s very, very slim. Most people using computers do not use it to play games. True, if you’re a gamer, the PC is the machine to go for. But that’s not a general reason to stick with the PC. Q. Is your Keyboard connected? you can use that to tab around the Modal and install the said drivers. Failing that, I’m not sure how else we could of enabled you to install the driver unless we didn’t ask you and it auto-installs? In which case this will happen everytime you put the CD in? How would you counteract this? I feel you are being unfair to Windows. I’m sure you’ll have the same problem if you try to install a wireless mouse into a fresh Mac OS. Besides, I doubt whether Mac OS can install wireless non-mac mouse. I feel the sucessful or rathing cheating strategy of Mac is that they have total control over hardware, graphic card, audio, USB etc. All you need to do is enable mouse keys, then use your num-pad as if it where a mouse. Just press left-shift, caps-lock and num-lock at the same time.